The tiny, Himalayan kingdom of Bhutan has a unique national aspiration that sets it apart from its neighbors, China and India. (And certainly the United States too.) Rather than increasing its gross national product, Bhutan has instead made it a goal to increase the Gross National Happiness of its citizens. There's wealth in health, not just money, the Bhutanese have argued. And since the 197os, the country has taken a holistic approach to development, trying to increase the spiritual, physical, and environmental health of its people. And guess what? The strategy is paying off. A 2006 global survey conducted by Business Week found that Bhutan is the happiest country in Asia and the eighth-happiest country in the world. It's perhaps only a nation devoted to happiness that could throw its support behind this -- postage stamps that double as playable vinyl records. 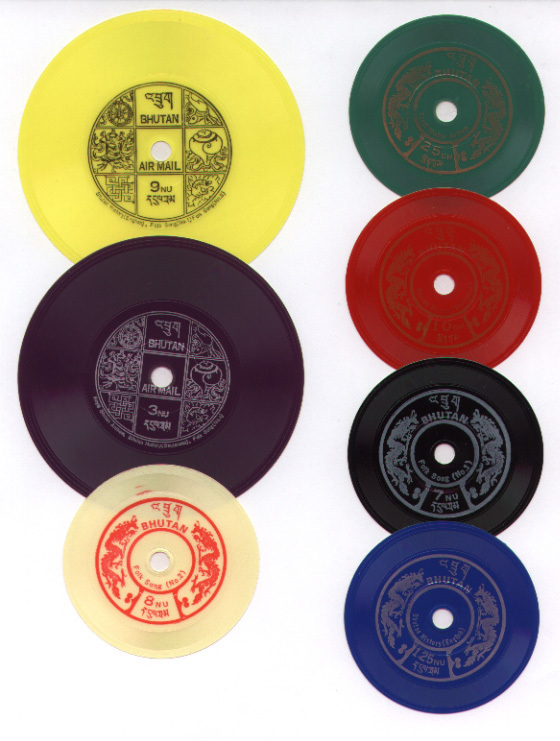 Created by an American entrepreneur Burt Todd in the early 70s, at the request of the Bhutanese royal family, the "talking stamps" shown above could be stuck on a letter and then later played on a turntable. According to Todd's 2006 obituary in The New York Times, one stamp "played the Bhutanese national anthem," and another delivered "a very concise history of Bhutan." Thanks to WFMU, our favorite independent free form radio station, you can hear clips of talking stamps above and below. Don't you feel happier already? To be honest these kind of lists never seem truthfull to me. No veo la relación entre estos ¿discos? ¿sellos? y la felicidad.